When the RFC 3270 Short Pipe mode is used, the PHB at the egress router is based on which of these? A. The topmost MPLS label EXP value. B. The MPLS VPN label EXP value. C. The Differentiated Services Field value in the IP packet header. D. The packet is re-evaluated, remarked, and the PHB is based on this new marking. A. The voice class is configured with the priority 128 command. B. The voice class is configured with the bandwidth 128 command. C. The gold class is configured with the priority 100 command. D. The gold class is configured with the bandwidth 100 command. E. The class-default class is configured with the fair-queue command. F. The voice class is configured with the police 128 command. Which statement about when you mix TCP and UDP traffic in the same class and overflow occurs is true? A. UDP traffic suffers more, because TCP guarantees delivery. B. TCP traffic is starved, because UDP never slows down when packets get dropped. D. Mixing TCP and UDP in the same class is not supported. Refer to the exhibit. 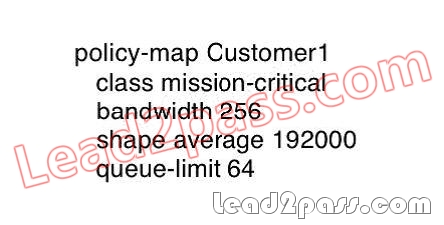 A customer’s policy profile was updated to increase the minimum bandwidth to 256 kb/s for mission critical data, but reports indicate that the policy now has an error. What change should be made to the policy to correct this error? A. The bandwidth statement should read 256000. B. Set the shape rate to a CIR that is higher than 256 kb/s. C. Use the shape peak command instead of the shape average command. D. Increase the maximum queue size to 128 to compensate for the mission critical data. E. The priority command should have been used, not the bandwidth command. A. Cisco IOS IP SLA is Layer 2 transport independent. B. IOS IP SLA uses active traffic monitoring which allows users to analyze service levels for IP applications. D. Cisco IOS IP SLA can be used to help detail billing information for each defined class of service. E. IP SLA uses NBAR to provide the reporting engine for statistics that it collects. Where would you apply WRED to avoid congestion and poor QoS from oversubscription of the network? Which MQC capabilities are unique to Cisco IOS XR Software? A. The MPLS VPN service provider is using Penultimate Hop Popping. A customer reports that the packets from their custom TCP application, which is currently marked as DSCP AF43, is being dropped more frequently than desired. All of the links in service provider network are using DSCP-based WRED. What can be changed to best improve the drop rate of the customer’s custom application without causing major problems for the other traffic classes? A. Remove WRED on all the links. B. Mark the custom application traffic to DSCP EF instead. C. Mark the custom application traffic to DSCP AF41 instead. D. Use a different queuing method for the AF43 traffic class. E. Allocate more bandwidth to the AF43 traffic class. Which Cisco IOS XR command will help troubleshoot why a policy map fails to apply on an interface? Refer to the exhibit. Your MPLS network is using RFC 3270 Uniform mode. Your customer reports that when a Microsoft NetMeeting call is placed between the workstations, the user at 172.16.1.2 experiences acceptable audio quality but the user at 172.16.2.2 experiences poor audio quality. What course of action should you take? A. Change your policy to not remark audio packets within your network. B. Have the customer set the correct marking of audio packets at the 172.16.1.2 device. C. Have the customer set the correct marking of audio packets at the 172.16.2.2 device. 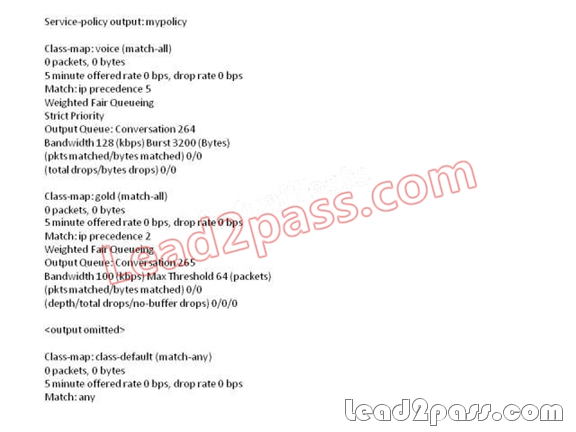 D. Use a policy map at the ingress to the PE1 router to remark packets from 172.16.1.2. E. Use a policy map at the ingress to the PE2 router to remark packets from 172.16.2.2. Which Cisco IOS command lists all traffic classifications? If you want to pass Cisco 642-785 successfully, donot missing to read latest lead2pass Cisco 642-785 exam questions.